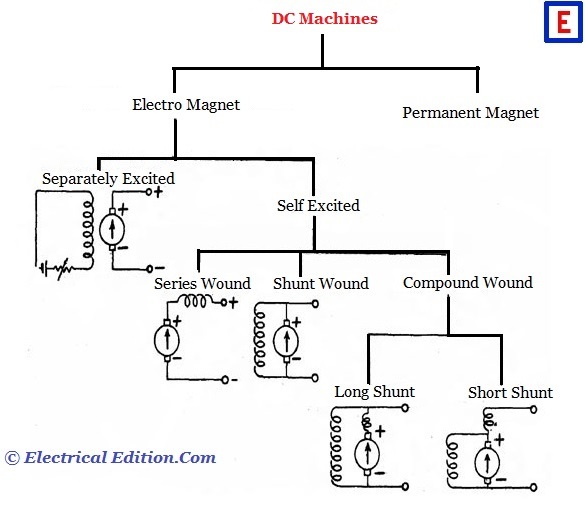 A DC machine is an electromechanical energy conversion device. It requires magnetic flux conductors and the relative motion for the energy conversion. 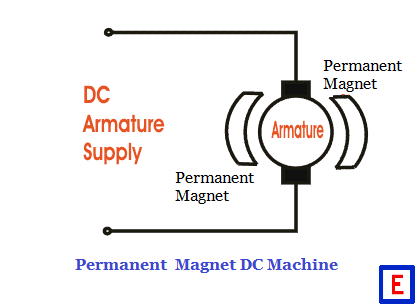 Based on the production of magnetic flux (i.e., exciting the field winding) the DC machines are classified as follows. This type of machines are of low rating and consists of the magnetic poles fixed in the inner periphery and the armature coils feed or being fed by the supply in case of generator and motor respectively. In the separately excited machine the field windings are being fed by a separate D.C source (battery) and the. 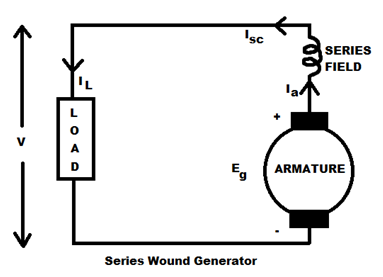 e.m.f generated in case of generator would be the sum of the supply voltage and the armature resistance drop. In case of self excited machines, the field winding is connected to the armature, so that the armature could feed the field coils. Let us consider, these conditions of connecting field winding in case of generators. If the field winding is connected across the armature winding then the machine is called the shunt machine. 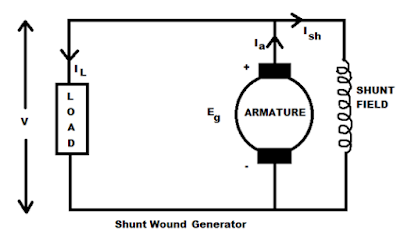 In the shunt generator, as the shunt winding has to overcome the generated voltage it has to be made with higher turns of lower cross-sectional conductors. They have higher resistance as compared to the series coils,but the current is less. 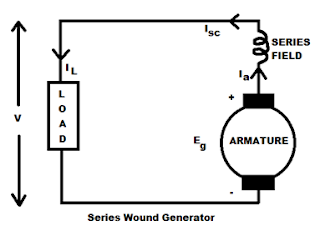 In this type of generator the field coils are connected in series with the armature terminals and the conductors would be of higher cross- section and with lesser number of turns. The current flowing through the coil would be the same as that of the armature current. So, it is made with higher cross-sections. 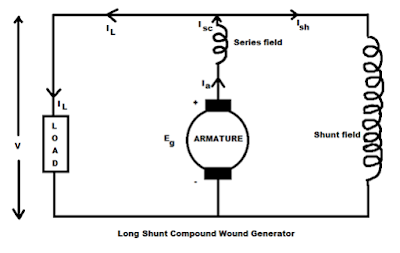 The combination of two windings i.e., series winding and shunt field winding is considered as a compound generator. In the compound generator, normally the field of the shunt will be more'than the series field and will be less than the individual shunt machine. The same is the case with the series field also. (i) Long shunt, (ii) Short shunt. 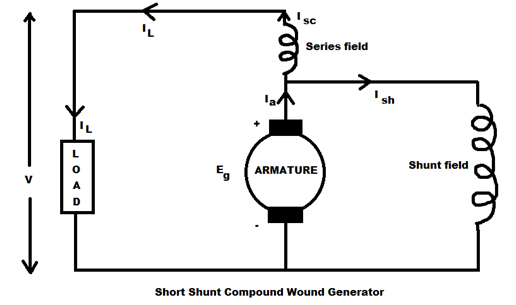 In this type of compound machine, the series current and the armature current is made , same and the shunt connection is made after the series connection is done. In this type of machine, the series field current is made same to that of the line current. 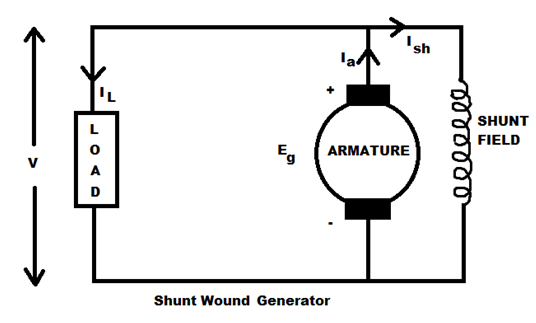 The connection of shunt field is done first and then to the series field. 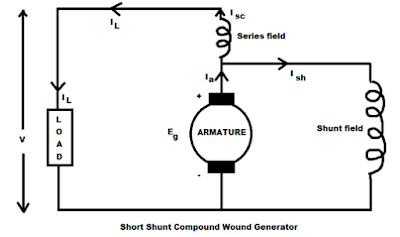 Whatever the connection of machine long or short shunt machines, if the flux produced by the series field aids with the shunt field then the machine is called cumulative compound machine or if the series field opposes the shunt field then the machine is called the differential compound machine.